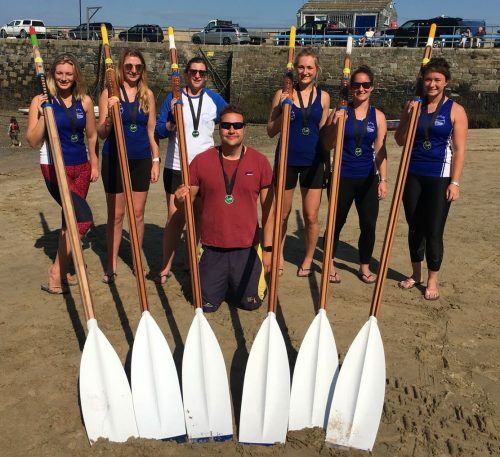 Four women’s crews attended the Newquay Championships – a great turn out for experienced and new rowers to represent their club and take part in some competitive rowing. 105 crews took part, with 18 races starting off the first round. With each race the crews that place 1st and 2nd are automatically through to the next round, as well as the next 12 fastest. Round 2, again 1st and 2nd go through to the quarter-finals. Then it’s the semi-finals, from these races the winner goes through as well as the next 4 fastest crews. Everyone in the D crew was taking part in their first ever Newquay championships. Wendy has participated in lots of different rowing events, but Newquay championships is the one she hadn’t done yet – until now. Well done to Fran who had only rowed in the sea for the first time the week before at the rescheduled Lyme Regis regatta. D crew were in the 7th race with some tough competition, finishing up 6th in their heat. C crew were the first crew up for Bristol, going in at heat 2. A tough group with Newquay A and Coverack A in the running for getting the first two places, so getting a good time was their main objective. They came in 3rd in their heat, pipping Mounts Bay C to the post by 1 second and comfortably beat our nearest neighbour’s A crew – Clevedon. Unfortunately, their time wasn’t quite quick enough to get through to the next round. B crew were straight in after D crew in heat 8. Helford A were quick from the start, so the battle for 2nd place was on between Lyme Regis and Bristol. Bristol remained close to Lyme Regis all the way round and made good ground at the mark, but came 3rd, just 1 second behind Lyme Regis A in the end. Thankfully their time was fast enough to get them through to round 2. This time they were placed with Dart A, Caradon C, Coverack B, Bridport A, finishing up 4th just 4 seconds behind Caradon C.
A crew won their first two heats comfortably, to secure a place in the quarter-finals. On Sunday they then won their heat in the quarter-finals. Next up was the semi-finals, where their winning streak was broken by Mounts Bay A beating them by 14 seconds, but held second place ahead of Helford A. All waited with baited breath to see if their time was enough to get them through to the final – and Bristol made it in! The final was made up of Mounts Bay A, Caradon A, Fowey A, Bristol A, Helford A and Falmouth A.
Footage available to view on Gigrower’s facebook page.